Dean Michael Feuer also provided an update on the Graduate School of Education and Human Development at the March meeting. The university’s core indicators of academic excellence are steady or improving, especially the undergraduate graduation rate and first-year retention rate, George Washington University Provost Forrest Maltzman told the Faculty Senate on Friday. Four- and six-year undergraduate graduation rates have increased since last year’s available data. For the fourth year, the university’s four-year graduation rate increased, and the class that entered in 2014 had the highest four-year graduation rate in recent history—78.3 percent, which is up from 75.9 percent for those who entered in 2013. Likewise, the university continued to make progress on its six-year graduation rate and will report for the first time five consecutive years with a graduation rate of more than 80 percent. For students who entered in 2012, the six-year graduation rate is 82.1, up from 80.5 percent for those who entered in 2011. Dr. Maltzman also said that GW’s first-year retention rate for students who entered in 2017 improved (92.9 percent) compared with the 2016 cohort (91.4 percent). “A school’s graduation and retention rates are a testament to everything we do,” Dr. Maltzman later said, noting that the design of financial aid packages, the opportunities students have in class, the university’s reputation, the design of meal plans and quality of residence halls all play a role in students’ willingness to stay at GW. “We have made unbelievable progress in improving our graduation rate but need to do even better in the years ahead,” he added. The distribution of enrolled students’ high school GPAs has also remained strong and relatively consistent since last year’s report. How students do in high school is the “single best predictor” for how they will do at GW, Dr. Maltzman said. In response to a faculty member question about what the university is doing to increase student retention, Laurie Koehler, senior vice provost for enrollment and the student experience, said GW is for the first time this year surveying sophomores to ask about their experiences and if they are considering transferring and why. This will help the university better understand the resources students may need, improve their experience and retain them, Ms. Koehler said. Examining students’ degrees and majors, Dr. Maltzman said many students are graduating with two majors or are pursuing majors or minors in more than one school, an indicator of students’ interest in interdisciplinary education. He also pointed out that even though the percentage of students pursuing a major in science, technology, engineering and mathematics (STEM) has steadily increased, from 10.4 percent in 2009 to 18.9 percent in 2018, it is still below virtually all the university’s peers. “I believe we can no longer aspire to preeminence with that small a fraction of our student body studying STEM,” President Thomas LeBlanc said. Dr. Maltzman’s report also showed that enrollment growth has occurred primarily online, and it included information on the number of students applying to GW. Undergraduate applications to the university for fall 2019 will increase by almost 2 percent over applications for fall 2018 and will exceed 27,000 for the second time in the university’s history. Dr. Maltzman also included in his presentation data from the Integrated Postsecondary Education Data System showing both non-medical full-time staff and faculty positions relative to GW’s student count over time and across the market basket, as well as data on the proportion of students taught by part-time faculty. “Taking into account our physical and human capital infrastructure is important when thinking about how big an institution we want to be,” Dr. Maltzman said later. Reporting on indicators related to faculty, Dr. Maltzman said as of the university’s 2018 census GW employed 882 regular, tenured or tenure-track faculty members. He also noted that among regular, research and special service faculty, 46.5 percent are women and 10.2 percent are from underrepresented minority groups. Faculty members who log on from a GW computer can use the Institutional Research website to see more data on faculty, including data by school. The full core indicators report also is available online (PDF). 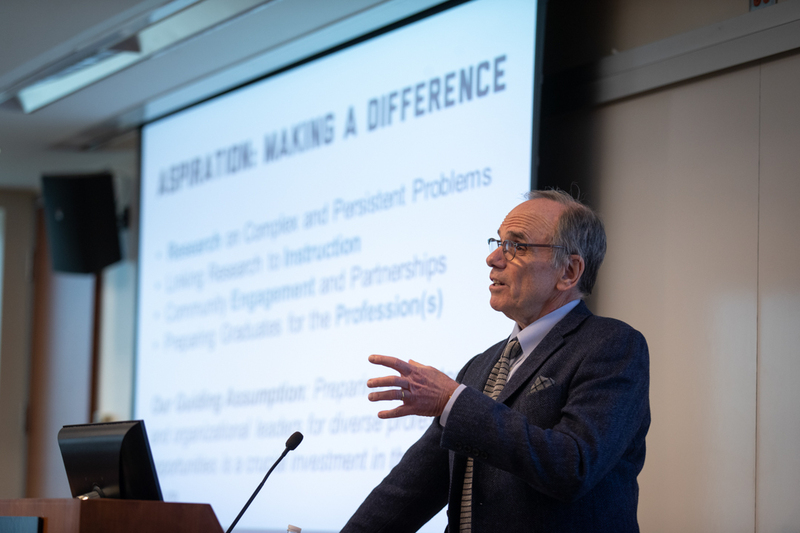 In a separate update to the senate, Graduate School of Education and Human Development Dean Michael Feuer said the school, its centers and special projects “aspire to make a difference” through research, instruction, community engagement and preparing graduates for education professions. “It’s a small school with a big agenda,” Dr. Feuer said. In fall 2018, GSEHD enrolled 1,339 students in master’s, doctoral, certificate and online courses and programs. GSEHD graduates go on to work for organizations such as the U.S. Department of Education, DC Public Schools, Google and CVS Health. “In fact, they’re getting very interesting positions in business, government, education, higher education, leadership and the like,” Dr. Feuer said. The school has 74 faculty members, including 45 tenure and tenure-accruing. Fiscal 2018 research expenditures topped $6 million, funded by federal and foundation sources. Continued challenges for the school include cost and competition, funding research and space, Dr. Feuer said. The university hopes to have new deans in place for the Columbian College of Arts and Sciences and School of Engineering and Applied Science by the start of the new academic year. Search committees for deans for the School of Medicine and Health Sciences and GW Law are formed or forming. Dr. LeBlanc provided background on how the university makes operating decisions during inclement weather, emphasizing that the safety of students, faculty and staff is the most important consideration. He added that the university is now offering more flexibility for faculty and staff who need to make alternate arrangements during inclement weather when the university is still open. Faculty and staff received more information by email on Friday. Nationally recognized student affairs leader will join GW in July.